This article is about the original Wii U version of Mario Kart 8. For the Nintendo Switch version of this game, see Mario Kart 8 Deluxe. Mario Kart 8 is a racing game developed primarily by Nintendo EAD, with Namco Bandai Holdings assisting, for the Wii U. It is the eighth installment in the main Mario Kart series (hence the game's name) and, including the arcade games, the eleventh overall. This installment is the follow-up game of the Nintendo 3DS title Mario Kart 7. Like other Nintendo 3DS and Wii U games, this game can be purchased both physically at retail and digitally through the Nintendo eShop, with the digital version requiring 4949.8 MB (approx. 4.83 GB) of memory to be installed. The game was released on the last three days of May 2014 worldwide. A prominent new addition is anti-gravity, allowing players to drive on almost any surface. Elements from Mario Kart Wii and Mario Kart 7 are reused, such as 12-racer fields, Bikes and 2-Player online from Mario Kart Wii; and gliding, underwater driving, and kart customizing from Mario Kart 7. In addition, ATVs join the returning karts and bikes as a new class of vehicle. The game also features more detail in courses, specifically retro tracks, which appear more redesigned than their original appearances. The game is also the best selling title for the Wii U, selling 8 million copies as of September 30, 2016, surpassing sales of both Mario Kart: Super Circuit and Mario Kart: Double Dash!!. On November 7, 2017, the Miiverse service was terminated by Nintendo, which makes it no longer possible for players to use this game's Miiverse stamps, upload highlight reels onto YouTube, and create online tournaments (though it is still possible to attend the pre-existing ones). Mario demonstrating the anti-gravity mechanic in Mario Circuit. The gameplay maintains the traditional elements of previous Mario Kart games, mostly from the two recent installments on the Wii and Nintendo 3DS respectively. Players pick a character of three weight classes and drive vehicles of varying stats, strengths, and weaknesses around an obstacle course-like racetrack, in an attempt to finish first of the twelve racers, the number of racers used in Mario Kart Wii. During the race, racers can pick up items from Item Boxes, where the probability of receiving items is dependent on the racers' distance from the frontrunner; for example, first place typically receives defense items such as Bananas and Green Shells, while racers at intermediate distance from the lead receive more powerful offense items such as Triple Red Shells and Fire Flowers and racers far from the lead receive items that lead to an increase in speed or the possibility of going off-road without losing speed, such as the Super Star or Bullet Bill, to help compensate their distance. Players receive an amount of points depending on the position they end up with. Whichever player has the most amount of points wins the entire race. Karts, which feature similar designs from Mario Kart 7, can be customized once again, alongside the returning bikes, which handle similar to the karts now and can only perform a wheelie via a boost, and the newly introduced ATVs. The hang-glider and underwater mechanics also return from Mario Kart 7, as well as Coins, with the player being able to collect up to ten in one race, and automatic drifting activated by steering in a direction for a certain amount of time, with a turning capability that, unless a Wii Remote without motion controls is used, matches the one while drifting (and even surpasses that in the case of sport bikes) and the ability to slowly charge Mini-Turbo and Super Mini-Turbo boosts, added in this game. . Tricks and the ability to look behind also return in this game. The newest feature for the series is anti-gravitational segments that not only allow for more dynamic track design, but also for racers to drive across walls, ceilings, and other seemingly unusual places. When in anti-gravity, if a racer bumps into another racer, the kart spins rather than just bumping and both racers receive a speed boost. This is called a "Spin Boost". Two types of bikes return: standard bikes, that perform regular drifts, and sport bikes, that lean toward the inside of the turn instead of drifting. While leaning instead of drifting, sport bikes lose less speed, but have a lower turning capability with respect to outside drifting vehicles, this being a feature seen in Mario Kart Wii as well. The game also features Wii U GamePad integration. In addition to the standard Off-TV Play, players also have the option of displaying the course map, and when neither the television gameplay nor the map are being displayed, the GamePad can be used as a horn button. Players have the option to toggle between these features at will. The GamePad can also be used to toggle on and off the gyroscopic steering, and in its default display and when displaying the map the GamePad also displays the current rankings. There is also Miiverse integration, which allows players to share their replay videos and comment on others' videos, in a feature called Mario Kart TV. Another change is that in 2-player mode, the screen splits vertically instead of the horizontally in the other console Mario Kart games, a feature that was originally intended to be in Mario Kart 64 but was removed from the final game. Additionally, if the player falls off the edge of the track, Lakitu will pick them up and drop them back on to the track more quickly when compared to how he did this in past installments. This makes glitches involving falling into areas impossible. In Super Mario Kart, Mario Kart 64, and Mario Kart Super Circuit, 5th or worse forces the player to retry the race. If the racer fares this badly four times, the Grand Prix must be started over (except in Mario Kart 64, where the player gets infinite retries). Starting with Mario Kart: Double Dash! !, to recent installments including this one, the Grand Prix goes forth normally. There are various game modes for Mario Kart 8. All modes available on single player (some also on local and online multiplayer) are listed here. Baby Luigi participating in a Grand Prix Race. Mario Kart 8's Grand Prix works similar to past installments. Like past games the 50cc, 100cc, and 150cc engine classes are available by default, and completing 150cc unlocks Mirror; for the former three, however, Grand Prix rankings carry over to the lower engine classes after being completed on a higher engine class. In addition, and for the first time in the series, a 200cc engine class has been added as of the version 4.0 update, which is available by default alongside Mirror as of version 4.1. Players choose a cup, which takes them through four consecutive races of set order in that cup. Only the Mushroom and Shell Cups (and the DLC cups) are available at the start of the game, with the others being unlocked after completing the cup before, and are available in every engine class after being unlocked. Players now have the option to do a multiplayer Grand Prix up to four players, unlike in most previous home console Mario Kart games, where only up to two players can race in Grand Prix. Mario begins his Time Trial run at Twisted Mansion. Time Trial mode lets the player complete a selected course in the fastest time possible. Among the other features, in addition to viewing ghost data, players can upload their own ghost data onto Miiverse, which other players can download and comment on. In addition, beating one of Nintendo's Staff Ghosts in a race earns the player a stamp based on the course they raced on which they can use in Miiverse posts. Leaderboards as seen in Mario Kart Wii also return. Four Miis in a multiplayer race on N64 Rainbow Road. VS mode can be played locally with up to four players. 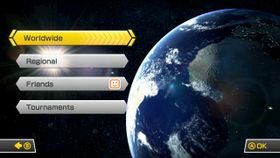 Players can set rules such as which items appear, the difficulty level of the CPUs, how many races to play, and whether to race on a Team or race Solo. Players can also set how the courses appear, choose a course after one is finished, or play all tracks randomly or in order. In this game, Mirror Mode appears as a default engine class, even if it isn't unlocked in Grand Prix. The point system is the same as the Grand Prix. Battle mode now features race tracks remixed to fit battle mode rather than containing all-new separate arenas. Balloon Battle can be played in teams or in free-for-all mode. It combines survival battle mode from Mario Kart DS and earlier installments and the timed points battle mode introduced in Mario Kart Wii; all players start with three points and three balloons each. Successfully making an opponent lose a balloon awards the player a point, and losing a balloon through any method will cause the player to lose a point. Balloons can never be regained (unless one is stolen from another player with a Mushroom or a Super Star), and if all balloons are lost, points can no longer be lost or gained. Defeated players can still drive and attack players as a Ghost, although they cannot receive points. Players can also now adjust the time limit from one to five minutes, and they can set up to 32 rounds in set intervals. Main menu for the Online mode. As with Mario Kart Wii, one or two local players can play over the Internet against other remote players. Players can race and battle with up to eleven other players from around the world or in their region, and can join and race with friends from the Friends menu. Finally, players are able to join a worldwide room using custom rules. Players can also set up their own rooms for friends and can race with custom rules, such as engine class, whether items are on or off, vehicle types available, control method, whether to play with computer players or not. As of version 3.0, players can also toggle whether they want to play on just the original 32 courses, the original courses and one of the two sets of DLC courses, or every available course by pressing after selecting Worldwide or Regional, as well as when setting up a room for friends. When playing online worldwide or regional, players once again earn VR points based upon their ranking at the end of a race or battle like in Mario Kart Wii and Mario Kart 7; like in Mario Kart 7 a player's VR starts at 1000, though like Mario Kart Wii players have different VR rankings for races and battles. Between 1000 and over 4000 VR when playing Worldwide or Regional VS. Race, players race at 100cc, and starting at over 5000 VR, players race at 150cc. Players can also create their own tournaments, similar to the communities from Mario Kart 7. When creating a tournament, players can choose an icon and a name for their tournament as well as set the rules, including engine class, whether to play in teams or not, whether to have items or not, vehicle types, whether there are computer players or not, and, as of version 3.0, available courses (the original 32 courses, every course including DLC courses, just the DLC courses, or, as of version 4.0, the original courses and one of the DLC packs). Players can also set times in which the tournament is available (weekly, daily, or between a fixed period and at what day and time the tournament begins and ends), the number of races before scores are totaled, and whether the groups shuffle after every four matches or not. Finally, the availability can be set, including whether a code is required, or if it is open to anybody worldwide or regional, and whether only players of certain ratings can play. When looking for a tournament, players can enter a code, search by type, or look at active tournaments. In addition, playing in a tournament that allows the DLC tracks to be selected requires purchasing the DLC before the player can enter. After entering a room, players can choose one of three predetermined tracks or "Random", which chooses one of any of the game's tracks at random if the player's option is ultimately chosen (this is to prevent people from selecting the same course repeatedly). When playing with friends, however, players can select from any of the tracks available depending on the settings. Once every player has selected a track, a roulette selects one of these options as the track to be raced on. Mario Kart TV is an Internet-based feature in which players can view and share highlights of their and others' race and battle highlights. In the Mario Kart TV menu, the game automatically saves the twelve most recent race and battle replays, and the player can favorite up to six at one time. Players can view and edit theirs and others' replays by changing the duration of the replay and the focus characters and actions and can slow down, speed up, and rewind the replay while watching. Players could also share their highlights on Miiverse and YouTube; only up to 60 seconds of video could be uploaded at one time, however. The full character select screen, including the downloadable characters. 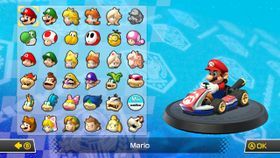 There are 36 total playable characters in Mario Kart 8, consisting of 16 default characters, 14 unlockable characters, and 6 characters obtainable by purchasing the DLC packages. Including the add-on characters, there are 14 new playable characters, being the seven Koopalings (indicated by an * in the gallery), Baby Rosalina, Pink Gold Peach (indicated by an **), Tanooki Mario, Cat Peach, Link, Villager, and Isabelle. Even though there are a total of nine groups of characters sharing the same statistics, the official site divides the initial 30 characters in three weight classes dependent on the weight of the character: light, medium, and heavy. Unlike other Mario Kart games (barring the use of glitches), multiple players can use the same characters, both in local and online play. The add-on packs contain three new characters each (see here for more info), but if both are purchased, the player will gain access to eight new colors for Yoshi and Shy Guy as well. Updates have been released that allowed suits to be unlocked by using amiibo, which allow Miis to resemble characters such as Samus Aran and Sonic the Hedgehog. *** - Mii's weight is determined by the height and weight of the Mii the player chooses to race as. Included in the game's two downloadable content packs (The Legend of Zelda × Mario Kart 8 and Animal Crossing × Mario Kart 8) are three additional racers, making six total. In addition, by purchasing both packs the player immediately obtains eight new colors for both Yoshi and Shy Guy. The Villager, included with the Animal Crossing pack, also has both a male and female variant. * - The CPU drivers do not drive as the different colored Yoshis and Shy Guys. Unlike previous Mario Kart games, characters (other than Mii) are unlocked at random by completing cups; however, another character cannot be unlocked by replaying a cup, making this title the first and only Mario Kart game that has done so. In previous games, fixed characters are unlocked by completing specific cups with specific engine classes. Additionally, for the first time in the series, unlockable characters appear as CPUs during races when they are still locked. Mii is the only character not randomly unlocked and is instead always the eighth character unlocked, unless the player uses an amiibo to unlock a Mii costume, in which case it will be unlocked immediately. Miis will never appear as CPU players. Mario Kart 8 uses a rival system that is similar to how its predecessor, Mario Kart 7 handles it, with several alterations. A set rival system is present only in the Grand Prix mode of the game; all other modes, including single player VS and battle are not affected and have randomized CPU opponents. Furthermore, only the original characters from the E3 build of the game receive a set system of rivals (Mario, Luigi, Peach, Daisy, Yoshi, Wario, Donkey Kong, Bowser, Koopa Troopa, Waluigi, Toad, and Toadette). The rest of the playable characters do not have a rival system of any sort, and all of their opponents in any modes are randomized. If there is more than one player participating in a Grand Prix, the first player's character determines whether there is a rival system or not, and what specific rivals the game gives the character. If other players choose the rival characters, the rivals are replaced by another, random character. These characters appear as part of a crowd and world-building scenery and do not directly affect any participating racers. These characters and features may either aid or act as obstacles and other intractable objects which impede racers if bumped into. Barrel Toad Harbor, Cloudtop Cruise, 3DS DK Jungle, N64 Yoshi Valley, Wild Woods These stationary objects break, and slow down the player on contact, while having a chance of releasing a Banana, a Mushroom, or a Green Shell when broken. Board 3DS Piranha Plant Slide These are in the shape of Goombas and plants. Players can break through them, but they lower the vehicle's speed. Bone Piranha Plant Bone-Dry Dunes These enemies stay situated in a Warp Pipe and lunge at any racer that drives near them in the direction they face. Racers who are struck by them flip over. Boo Twisted Mansion Several Boos appear in the gliding segment of Twisted Mansion. Players who bump into them lose some air speed. Boulder Bowser's Castle Two cannons that shoot boulders are found in the last segments of Bowser's Castle. The cracked ground indicates where the boulder is going to land on. If players get hit by a rolling boulder, they flip over. Bouncing Notes 3DS Music Park These enemies bounce to the rhythm of the course, and for every bounce, a player can trick off the jump. When a certain time has passed, typically around the length of a final lap, these notes bounce faster, though not as fast as they have been in their original iteration. Bouncing Notes can squash players, but they serve as walls rather than obstacles. Bowser Monument Bowser's Castle This huge stationary obstacle pounds the ground with his fists, sending shockwaves that cause trickable ramps. Racers can get squashed by him, but his arms do not harm racers if they touch it. Chain Chomp GBA Cheese Land As in previous Mario Kart games, these enemies are bound by a stake and lunge when players drive close to them. If a player gets hit by them, the player flips over. Cheep Cheep DS Cheep Cheep Beach These serve as minor obstacles. Similar to Boos, they slow air speed for players that hit them during gliding sequences. Chomp N64 Rainbow Road Chomps bounce on certain parts of the track, stationary to their position. They create distortions on the road, causing players to possibly trick off the waves created by the bounce. Players who get hit by Chomps flip over. Crate Toad Harbor, Sunshine Airport Similar to Barrels, these stationary objects break, and slow down the player on contact, while having a chance of releasing a Banana, a Mushroom, or a Green Shell when broken. Deku Baba Hyrule Circuit Their design taken from The Legend of Zelda: Skyward Sword, these act identically to Bone Piranha Plants and the lunging Piranha Plants. They lunge after players who drive too close to them. Any player who gets hit by them flip over. Drain Pipe 3DS Piranha Plant Slide These Warp Pipes well water that cancels the gliding of players that drive under it. The Warp Pipes themselves, on the other hand, merely serve as an obstruction. Dry Bones Bone-Dry Dunes Dry Bones wander back and forth on the last stretch of the track. They act similarly to destructible walls; any player who collides with them slows down and ends up destroying the Dry Bones in the process. Fire Bar Bowser's Castle, DS Wario Stadium Fire Bars are stationary objects that rotate their fireballs. Players that run into the fire burn and spin out. Fire Snake Wii Grumble Volcano Fire Snakes emerge from Warp Pipes. They bounce around an area of the track, and disappear over time. They spin out any player who runs into them. Freezie GCN Sherbet Land Freezies are stationary objects found in the latter part of the course. They are breakable, and any player who runs into them spins out. Unlike their original appearance in Mario Kart: Double Dash! !, they do not freeze players. Frogoon 3DS DK Jungle These enemies slowly hop back and forth, and any player who gets hit by them spin out. Goomba Mario Circuit, N64 Yoshi Valley, 3DS Piranha Plant Slide Goombas walk slowly back and forth. Running into one causes the player to spin out. Goomba Tower Mario Circuit Appearing near the end of the course, Goomba Towers vary from height to height. Unlike regular Goombas, these Goombas are an obstacle to airborne racers. Running into them causes the player to spin out, and if the player is gliding, the player falls to the ground. Bowser Statue Bowser's Castle In the beginning of the course, usually on only the first lap, these statues serve as decoration. As time passes, however, they shoot out lasers that hit the ground. Any player who drives into the lasers spin out. Hammer Knight Twisted Mansion These enemies, possessed by Boos, appear at the end of the track, swinging their hammers towards incoming racers. Keese Hyrule Circuit These enemies replace the Swoops seen in other courses, and they take their design from The Legend of Zelda: Skyward Sword. Hitting one of them slows the player down. Mechakoopa GBA Ribbon Road These enemies are found slowly patrolling the green section of Ribbon Road. Hitting one causes the player to spin out. Monty Mole Wii Moo Moo Meadows, SNES Donut Plains 3 Monty Moles burrow underground for most of their duration. The trail they leave behind are trickable ramps. Monty Moles eventually pop out of the ground and leap up, which can hit players and cause them to flip over. Moo Moo Wii Moo Moo Meadows Moo Moos stay stationary early in the match, but wander to the road as time goes on. Any player who runs into a Moo Moo spins out. Moo Moos also take item hits from shells. Mr. Resetti Animal Crossing (all seasons except winter) Mr. Resetti occasionally pops off the ground near the end of the track and appears to be angry. Hitting Mr. Resetti causes players to flip over. He does not appear in the winter version of the track. Oil Slick GBA Mario Circuit Dotted throughout the course, oil slicks cause players to spin out. They can be avoided by hopping over them. Sweet Sweet Canyon, Mario Circuit, Electrodrome, N64 Royal Raceway, 3DS Music Park, 3DS Piranha Plant Slide, GCN Yoshi Circuit Two types of Piranha Plant exist. The type that is found on N64 Royal Raceway is a stationary, small, yet passive obstacle that is found throughout the track. Players who run into them spin out. The other type of Piranha Plant, which is always found in a pipe, is found in Sweet Sweet Canyon, Mario Circuit, Electrodrome, 3DS Music Park, 3DS Piranha Plant Slide, and GCN Yoshi Circuit. While also stationary, they lunge towards any racer in front of and close enough to them. These Piranha Plants are found only in set areas of the track and flip racers that they successfully hit. The Piranha Plants in Sweet Sweet Canyon, 3DS Music Park, and 3DS Piranha Plant Slide are much larger than other ones, and the Piranha Plants in 3DS Piranha Plant Slide change direction of where they bite over time, similar to some of the Bone Piranha Plants. Pokey GCN Dry Dry Desert Pokeys are stationary enemies that lumber back and forth. At times, they attempt to bend over in order to hit enemies; coins appear directly next to the spot where they bend over, and disappear when Pokeys revert to their original position. Players spin out if they hit a Pokey. Screaming Pillar 3DS DK Jungle These are statues that blow air at intervals. The air they blow out lowers air speed. Sidestepper DS Cheep Cheep Beach Sidesteppers patrol back and forth underwater in DS Cheep Cheep Beach. They can be defeated with shells, but running into one of them spins the player out. Skating Shy Guy GCN Sherbet Land Ice skating Shy Guys dance around at the beginning of the course. Any player who runs into them spin out. There are two color varieties: the blue ones, who skate by themselves, and the the red ones, who skate together holding hands. Snowboy Animal Crossing (winter only) Snowboys appear exclusively in the winter version of the Animal Crossing track. These obstacles slow the player down via acting like a destructible wall. Snowman GCN Sherbet Land Snowmen appear off-road. Unlike previous Mario Kart games, these obstacles only slow the player down via acting like a destructible wall. Spinner Bowser's Castle This obstacle appears hanging on a ceiling, swinging back and forth. Racers who drive into it get flipped over. Super Thwomp SNES Rainbow Road Behaving as they did in their original appearance and their appearance in Mario Kart 7, these are stationary obstacles that slam the ground repeatedly. The force of the impact creates waves that players can trick off of. Players can get crushed by these Thwomps, and touching one flips players over. Swoop N64 Yoshi Valley, Wii Wario's Gold Mine Swoops fly in groups in areas. They slow down any player who hits them, though players can temporarily defeat them with items. Thwomp Thwomp Ruins Thwomps are stationary obstacles that rise up and smash the ground repeatedly. They crush any player that is underneath them as they smash the ground, though touching them is similar to hitting a wall. Tiki Goon 3DS DK Jungle Tiki Goons patrol back and forth. Unlike their original iteration, they move more slowly. Players who drive into them spin out. Toads Bone-Dry Dunes, N64 Rainbow Road One of the only directly helpful characters, Toads throw coins onto the track. There are 22 karts, 6 standard bikes, 5 sport bikes, 4 ATVs (37 bodies in total), 21 sets of tires, and 14 gliders available to use in Mario Kart 8 for a grand total of 10,878 vehicle combinations. Of these, 8 karts, 1 standard bike, 1 sport bike, 1 ATV, 3 sets of tires, and 2 gliders are included in downloadable content packs, with the GLA, W 25 Silver Arrow, 300 SL Roadster, and GLA Tires appearing in the Mercedes-Benz × Mario Kart 8 pack, the Blue Falcon, B Dasher, Tanooki Kart, Master Cycle, Triforce Tires, and Hylian Kite appearing in the The Legend of Zelda × Mario Kart 8 pack, and the Streetle, P-Wing, City Tripper, Bone Rattler, Leaf Tires, and Paper Glider appearing in the Animal Crossing × Mario Kart 8 pack. Some parts can change colors either for every character, a specific group of characters, or based on a limited number of color schemes. The color schemes used by each Mii color serve as a default set of color schemes for each of the 12 colors which are also used by alternative Yoshi and Shy Guy colors as well as the Mii Racing Suits. All of them use the default color scheme for parts which have unique color schemes for only certain characters. The other characters may have personalized color schemes for their Standard bodies, Pipe Frame and Super Glider, and for the other parts, they may use other color schemes other than those of their expected color; for example, Mario's GLA is the gray one used by the yellow Miis instead of the red one used by the Miis wearing the racing suit based on him. Bold = Part is available at the start. * = Changes color, depending on the character. ** = Changes color for the Koopalings. *** = Changes color for Daisy, Baby Daisy, Rosalina, and Baby Rosalina. (DLC) = Part is only available as downloadable content. The "8" logos on the parts are replaced with the character's symbol, except on the Gold Standard and Gold Glider. 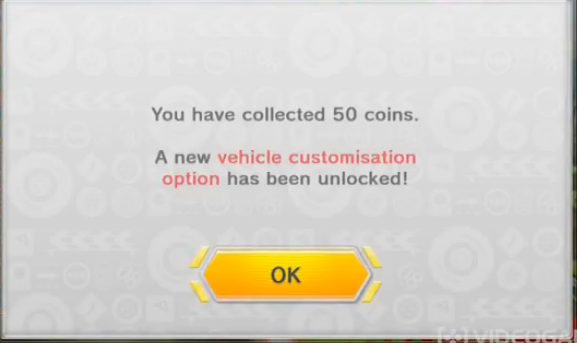 Vehicle parts are unlocked by collecting coins from Grand Prix, VS Mode, Time Trials, and online races. Coins collected by additional players are counted. Coins will count towards the player's coin total only for completed races -- if the player collects coins then quits during a race, the coins from that race will not be added to their coin total. There are 38 unlockable parts, excluding golden parts. Players can unlock new parts for every 50 coins, but once players have collected 1000 coins, 100 coins are instead needed to unlock new parts. Like in Mario Kart 7, players can see how many coins they have collected by viewing the statistics screen from the main menu (this feature is available for only Ver. 2.0 and further of the game). Gold Standard: Obtain a minimum of one star ranking in all non-DLC cups of every engine class. Gold Tires: Beat the Staff Ghost on 32 courses. Gold Glider: Obtain 10,000 coins. For the in-game tables from which these values were derived and for the tables to translate those values into the actual statistics used by the game, see Mario Kart 8 in-game statistics. Speed: The top speed of the vehicle on land with normal gravity. Acceleration: The rate of speed increase when holding the acceleration button. Weight: The weight of the vehicle. Vehicles with higher weight knock away vehicles with lower weight. Handling: The turning ability of the vehicle on land with normal gravity. A higher stat means vehicles turn sharper, and will continue turning normally for longer before automatically initiating a drift. Traction (Grip in Europe and Oceania): The grasp of the vehicle. Vehicles with higher traction slip less on certain terrain and can stay stable on the road better. Not to be confused with handling. 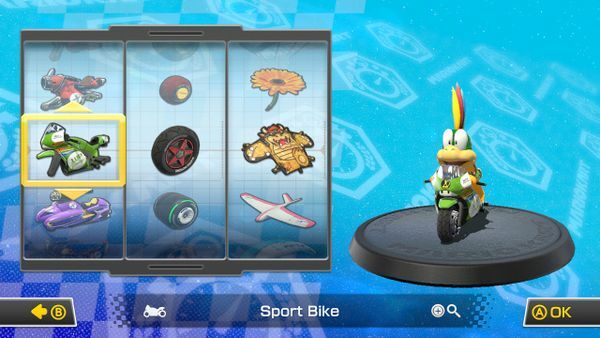 A combination consisting of Lemmy, Sport Bike, Slim Tires, and Bowser Kite. The values actually shown in the vehicle customization screen, matching the values calculated. Water Speed: The top speed of the vehicle while driving underwater. Air Speed: The top speed of the vehicle while gliding. Anti-Gravity Speed: The top speed of the vehicle in anti-gravity mode. Water Handling: The turning ability of the vehicle while driving underwater. Air Handling: The turning ability of the vehicle while gliding. Anti-Gravity Handling: The turning ability of the vehicle in anti-gravity mode. Mini-Turbo: The length of the vehicle's mini-turbo speed boosts. Just like in Mario Kart Wii, Miis can be Light, Medium, or Heavy, depending on their height and weight. The following tables report the statistics in points. The following table shows the statistics of the various parts in points. The Super Glider and Paper Glider form their own group, due to having different values in an unused statistic, which is On-Road Traction (ON). There are 32 tracks in the main game (excluding DLC Cups); 16 new and 16 retro, featuring one track each from Super Mario Kart and Mario Kart: Super Circuit, four tracks from Mario Kart 64, two each from Mario Kart: Double Dash!! and Mario Kart Wii, and three each from Mario Kart DS and Mario Kart 7. As with the retro tracks from the 3DS installment, those in this game feature altered sections that incorporate the game's hang-glider, underwater, and anti-gravity features. The game features orchestrated music for all of the new tracks and most of the retro tracks. 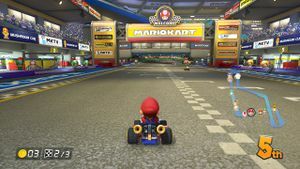 The tracks have been described as narrower compared to previous Mario Kart tracks, specifically those from Mario Kart Wii. Names in italics are names used in the PAL version. Four additional cups, each one containing four tracks for a total of 16, are included in the game's two downloadable content packs. This makes Mario Kart 8 the most extensive installment in the Mario Kart series, containing up to 48 courses, beating Mario Kart: Super Circuit's previous record of 40 courses in total. Each of the DLC cups contain a mixture both nitro and retro courses, making them the first cups in the Mario Kart series to do so. Because of the imbalance of nitro and retro courses, this makes Mario Kart 8 the only installment in the series to include more nitro courses than retro courses, with 25 nitro courses and 23 retro courses. The inclusion of SNES Rainbow Road also makes Mario Kart 8 the only game in the series to have more than two Rainbow Road tracks. Of those 16 tracks, seven of those are retro courses, adding one track from Super Mario Kart, Mario Kart Wii, and Mario Kart 7 and two from Mario Kart: Super Circuit and Mario Kart: Double Dash!!. The other nine courses consist of four original tracks and five tracks based upon other Nintendo franchises, including Excitebike, F-Zero, The Legend of Zelda, and Animal Crossing. Additionally, while some of the courses have gliding and/or anti-gravity sections, none of them have any underwater sections. The back of the trophies earned in these cups reads "PROFESSIONAL KART RACING DISTINGUISHED DRIVER". Just like in Mario Kart Wii and Mario Kart 7, the player starts out with Staff Ghosts for each course that can be raced against in Time Trial mode. However, unlike with the past Mario Kart installments, beating the Staff Ghost for each of the game's standard courses unlocks a stamp that can be used in Miiverse posts, rather than an Expert Staff Ghost. These are Nintendo's best times for each of the 32 base courses, as shown in the Prima Official Game Guide. Ghost data does not exist for the following times in-game. For the probability of getting each item when an Item Box is opened, see Mario Kart 8 item probability distributions. As in all Mario Kart games, Mario Kart 8 keeps the use of items during the races. Four new items have been added to the list, being the Boomerang Flower, the Piranha Plant, the Super Horn, and the Crazy Eight. The Coin also makes a return as an item since its first appearance in Super Mario Kart. 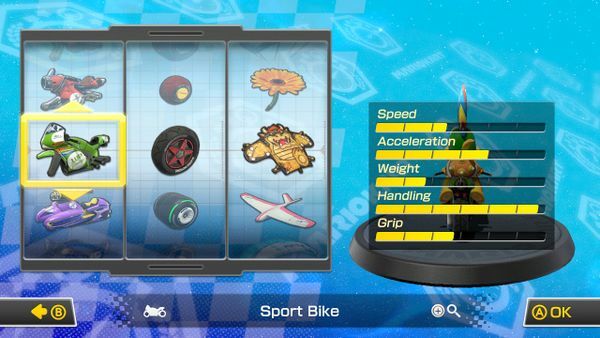 Mario Kart 8 also features changes to the items' mechanics. In the races, each item's probability of being obtained depends on probability distributions that are chosen based mainly on the distance from the driver in 1st place. This means that it is possible to get even a Bullet Bill in second. While past Mario Kart games allowed the users to gain a different item from the Item Boxes while dragging some other such as a Green Shell or a Banana, in Mario Kart 8, players are restricted to carry only the item they are currently holding or dragging. Releasing the item in use will then allow the player to take another from the boxes. In order to keep gameplay balance, some items are much less frequent to appear, most notably Lightning and the Spiny Shell. Additionally, the Triple Bananas, the Triple Mushrooms and the eight items of the Crazy Eight surround the vehicle in the same manner as triple shells do, and opponents receive their effects when touching them, giving some disadvantage, or advantage in the case of the Triple Mushrooms and the Star. Racers only lose the items they are holding in their hand when struck by a Lightning while items surrounding the drivers, with the exception of the Mushrooms, are lost when other racers touch them. The item icon, located on the top left of the screen, now displays a usage-remaining meter, either time remaining to use or uses remaining, for items with limited repeating usage. Item Box Gives the player a random item. Items given are based on the player's position. Coin Gives the player a small boost and increase top speed when more are collected, up to a maximum of ten. Rupee The equivalent of a coin, used for Hyrule Circuit. They replace coins in the item roulette and in the track. Bell The equivalent of a coin, used for Animal Crossing. They replace coins in the item roulette and in the track. Boomerang Flower Can be thrown up to three times, hitting racers forward/backward and when it returns to its user after the first and second use. Piranha Plant Automatically chomps on obstacles and other racers, giving a short speed boost for each bite. Super Horn Emits a radial shockwave hitting racers, as well as destroying all obstacles, including the Spiny Shell. Crazy Eight Generates eight items (Coin, Bob-omb, Mushroom, Star, Blooper, Green Shell, Red Shell, and a Banana) that circle around the player for them to use. Coin Grants the player two extra coins and a micro boost. Green Shell Travels in a straight line and knocks over a kart it hits. Triple Green Shells Three green shells that orbit the player's kart, protecting them from incoming attacks. Red Shell Homes in on the closest kart in front of the player and knocks it over. Triple Red Shells Three red shells that orbit the player's kart, protecting them from incoming attacks. Banana Protects the player from incoming items, and spins out other racers that hit it. Triple Bananas Three bananas that orbit the player's kart, protecting them from incoming attacks. Mushroom Provides the player's kart with a small speed boost. Triple Mushrooms Orbits the player's kart, providing them with three separate speed boosts. Golden Mushroom Provides the player's kart with continuous speed boosts for a short time. Fire Flower Allows the player to throw fireballs for a short time that cause other karts to spin out on impact. Star Provides the player invincibility from all terrain and items, and also giving a speed boost. Blooper Sprays ink on all racers ahead and reduces their visibility. The racers hit also lose some of their traction while sprayed. Bob-omb Explodes after a short time when thrown or dropped, knocking over any kart in its blast radius. Spiny Shell Targets the racer in first place, knocking over all other karts in its path. Lightning Causes all opponents to drop their items, shrink, and drive slowly for a short time. Bullet Bill Transforms the player into a Bullet Bill, rocketing through the track with auto-pilot, and providing invincibility from all terrain and items. As in Super Mario 3D World, NES Remix, and NES Remix 2, players can obtain stamps, which could previously be used in Miiverse posts. There are 100 stamps in the game: 28 are available from the start, while another 62 stamps can be obtained by winning a Grand Prix with every non-DLC character and beating the Staff Ghost on each non-DLC course in Time Trials. In addition, ten more stamps were added with the version 4.0 update. However, beating a Staff Ghost on a DLC course or using a DLC character to complete a Grand Prix will not unlock a stamp. As of the version 2.0 update, Mario Kart 8, like New Super Mario Bros. 2, includes an in-game shop feature through which players can purchase and pre-order downloadable content packs, as well as adding prompts where the character and cup icons are when purchased. Alternatively, players can purchase content packs through the Nintendo eShop like normal. Nintendo has released free kart parts as part of a collaboration with Mercedes-Benz, and then announced the game will receive two add-on packs, which both include three additional characters, four karts, and eight courses in two cups. Mario, Princess Peach, and Luigi driving karts themed after Mercedes-Benz vehicles. As part of a collaboration between Nintendo and Mercedes-Benz, a free downloadable content pack was released featuring kart bodies based on several Mercedes-Benz vehicles, including the GLA (based on the Mercedes-Benz GLA), the W 25 Silver Arrow (based on the W 25 Silver Arrow), and the 300 SL Roadster (based on the 300 SL Roadster), as well as a set of GLA Tires. The content was released in all regions during August 2014. Screenshots of Add-On Pack 1. The first pack, titled "The Legend of Zelda × Mario Kart 8", which was released during November 2014, includes playable characters Tanooki Mario, Cat Peach, and Link from The Legend of Zelda franchise. It also includes additional kart parts, such as the returning B Dasher and the new Tanooki Kart. The cups included are the Triforce Cup and the Egg Cup. Additional courses include both retro ones, such as Wario's Gold Mine from Mario Kart Wii, new courses inspired by non-Mario franchises such as the Excitebike-based Excitebike Arena, and completely new ones such as Dragon Driftway. Purchasing both this and the Animal Crossing × Mario Kart 8 pack unlocks eight alternate color skins for both Yoshi and Shy Guy each. Screenshots of Add-On Pack 2. The second pack, titled "Animal Crossing × Mario Kart 8" which was released during April 2015, includes Villager and Isabelle from Animal Crossing: New Leaf as well as Dry Bowser, returning from Mario Kart Wii. The cups included are the Crossing Cup and the Bell Cup. Like The Legend of Zelda x Mario Kart 8, additional courses include retro ones such as Cheese Land (returning from Mario Kart: Super Circuit), courses based on non-Mario franchises like Big Blue from the F-Zero series, and completely new ones like Wild Woods. Purchasing both this and The Legend of Zelda × Mario Kart 8 pack unlocks eight alternate color skins for both Yoshi and Shy Guy. Note that in order to play online, players must have downloaded the most recent software update. The map display on the TV screen. On the same day as the release of the Mercedes DLC, an update for the game also was released which adds an option to display the map on the TV screen (just like in past Mario Kart games) by pressing on the GamePad. A records section has been added to the main menu also by pressing , which shows how many total coins have been collected, online wins and losses (just like Mario Kart 7), and other statistics. The update also saves the players' last used vehicle combo (excluding DLC vehicle parts), lets them edit other players' highlight reels, and improves online stability. Additionally, the maximum online race and battle ratings have increased from "9999" to "99999", like in Mario Kart 7. The rating system has also been altered in that the amount of points that the players win or lose after an online race or battle is more drastic if there exists a large rating difference between participating players. In tournaments without race or battle limits, players can now have more than 1024 points during a tournament period; without the update, players with at least 1024 points have their score reset to zero for the next race/battle. The speed values of the CPU racers has also been adjusted for tracks such as Dolphin Shoals. Also, animations of some characters, such as Daisy, Rosalina and Ludwig have been tweaked. The update also swaps the 'Next Race/Round/View Results' and 'View Highlight Reel' buttons in offline mode, and adds a Shop button on the main menu, where players can purchase and download add-on content. The character icons on the map HUD are also altered. On November 13, 2014, the update to version 3.0 was made available. The update includes compatibility with amiibo figures and enables the first downloadable content pack for those who purchased it. The update also allows the game to save any last used vehicle combo that uses any of the DLC vehicle parts or characters. Also, when a light racer bumps into a heavier one, it will be pushed less far away. In terms of online, the race and battle rating system has been modified to be less punishing to players who do poorly in a race or battle. Additionally, players can now set up tournaments that have cup limitations. The update is required to continue playing online, but players cannot play in rooms or tournaments that include the downloadable tracks until they have purchased them. Players that have not purchased the add-on packs can still encounter the included characters and vehicles online, but cannot select them. The addition of 200cc in Ver. 4.0. Update version 4.0 was released on April 23, 2015, the same day as the Animal Crossing × Mario Kart 8 downloadable content pack. In addition to the downloadable content and some bug fixes, the update adds nine additional amiibo racing suits and compatible figures, and adds a "200cc" engine class. Ten new Miiverse stamps have also been added. The update also allows players to enable the on-screen map using any controller, rather than just the GamePad. In online mode, players can add CPU players when playing with custom rules, though only human players will count for scoring. Also, players who left a race/battle will not have their race/battle rating visible for other racers to see after a race/battle. The race rating and battle rating system remains the same as in update version 3.0. Finally, additional tournament settings have been added to support 200cc and the two cups in the second DLC pack. Larry Koopa, performing the new braking technique that is introduced in the 200cc engine class. Introduced as part of the version 4.0 update, 200cc is an engine class that presents a few important differences with respect to the other engine classes. Among the differences discovered so far, the most important are the speed, which is 150% the speed of the 150cc engine class (for comparison, the speed of the 50cc and 100cc engine classes are respectively 80% and 90% of the speed of the 150cc engine class) and causes acceleration to change every time the acceleration statistics changes, and a new braking technique, triggered only when braking while drifting: orange sparks come out of the driving wheels that start rotating at a low speed, a braking sound can be heard and the deceleration is slower, allowing tighter turns without necessarily losing the Mini-Turbo charge. Furthermore, some physics exploits appear to be less effective. The angular velocity of autodrifting has been revised as well and furthermore only in this class it appears to be unaffected by drifting type (inside drifting or outside drifting) and coins. Update version 4.1 was released on May 1, 2015. In addition to general gameplay adjustments and bug fixes, the update adds the Mirror and 200cc engine classes to Grand Prix mode by default, without having to unlock them. When playing in split screen, there are some minor and major differences on the race courses as in Mario Kart: Double Dash!! and Mario Kart Wii. Most changes are removals and simplifications to maintain proper framerate. The game will occasionally lower its rendering resolution to 1152x648 when many racers and particle effects are on screen. This happens more often in two player modes with CPU's turned on, and in GCN Sherbet Land. There is a lack of motion blur in online and offline multiplayer. Shadow resolution, shadow draw distance, and the resolution of alpha and lighting effects are reduced in multiplayer. The polygon count of CPU and other player characters are reduced. Trick animations of CPU's and other players are 30 fps in Two-Player Online. In Mario Kart Stadium and DS Wario Stadium, the large, broadcasting screen rotates between the players' point of views. The MKTV broadcast car is absent. In Mario Kart Stadium, GCN Sherbet Land, and N64 Rainbow Road, the fireworks have less sparkles. In GCN Sherbet Land, the jellyfish and firework crackers are absent. Also in N64 Rainbow Road, most of the fireworks are absent. The Toads on the space capsule are absent. The hologram of the Special Cup trophy is absent from the projector, but the beams of light are still present. The oval-shaped tube, where the starting and finish line is located in the middle of it, has a line of lights circling clockwise missing at the end where the racers exit. Similarly, the turning wheels at the sides of each auditorium were removed. The solar cells at the bottom of the space station were removed. The Blooper starship flying around the track is absent. In Twisted Mansion, the Boos in the gliding section are absent. The airborne road markers on gliding paths are absent on all courses that have them. In GCN Yoshi Circuit, some Yoshis on the track are absent, including the one on the watch tower. Similarly, some of the Shy Guys in the mine entrance of Wii Wario's Gold Mine are absent. In GCN Baby Park, most of the Yoshis and Toads are absent. In Wii Grumble Volcano, the Lava Geysers that usually show up after the sections of track sink are absent. Jellybeams are absent in Dolphin Shoals. The amiibo Mii Racing Suits menu as of version 4.1. Mii outfits alongside their amiibo. As of the version 3.0 update, Mario Kart 8 includes compatibility with amiibo, Nintendo's series of NFC enabled figurines. By scanning certain amiibo, players can unlock one of ten costumes for use by Miis based upon the amiibo character. The amiibo originally compatible are Mario, Luigi, Yoshi, Peach, Donkey Kong, Link and Toon Link, Kirby, Captain Falcon, Samus, and Fox. Nine more suits were later added with the version 4.0 update, unlockable by using the compatible amiibo figures: Mega Man, Sonic, Villager, Pac-Man, Toad, Wario, Olimar, Rosalina, and Bowser. Development for Mario Kart 8 started in 2012. Series producer Hideki Konno first revealed that he wanted to produce a Mario Kart game for the Wii U in late 2011. A Wii U Mario Kart game was later revealed to be in development in the January 2013 Nintendo Direct and confirmed to be shown off at E3 that year, with the game being officially revealed during the E3 2013 Nintendo Direct. Some ideas that were scrapped in Mario Kart 8 included a drill that made drivers drive into subterranean depths. The idea was scrapped because the developers thought it was not as interesting as the anti-gravity idea. The anti-gravity concept stemmed from the Wii U being a powerful console, and with the upgraded hardware, the developers wanted to make courses with a 3D plane in mind rather than the 2D plane as the other tracks in the Mario Kart series. The title, Mario Kart 8, also stemmed from the anti-gravity mechanic as, in addition to being the eighth main installment in the series, the "8" used in the official logo was stylized to resemble a Möbius strip. Most of the game's musical tracks are orchestrated, making this game the first Mario Kart game to feature orchestrated tracks. Nintendo and Pennzoil teamed up to promote Mario Kart 8 by hosting an event in which participants were able to race on real-life modified karts on a specially-designed track. Icons representing some of the items in the game were spread in the course as well. Between May 30 and July 31, 2014, Club Nintendo members in North America, Europe, and Australia who registered Mario Kart 8 could receive a free download code for one of several Wii U games. In Europe and Australia, players had the choice of: Nintendo Land, New Super Mario Bros. U, Game & Wario, Pikmin 3, The Legend of Zelda: The Wind Waker HD, Sonic Lost World, Mario & Sonic at the Sochi 2014 Olympic Winter Games, Wii Party U, The Wonderful 101, and Monster Hunter 3 Ultimate while North American players were limited to only New Super Mario Bros. U, The Legend of Zelda: The Wind Waker HD, Pikmin 3, and Wii Party U.
Mario Kart 8 has received mostly favorable reviews, and has been lauded as one of the best games in the series to date. General praise has been given to the game's graphics, the tracks, the music, and the overall gameplay (both single player and multiplayer). The addition of anti-gravity has also been praised, as has the online mode. The roster, however, notably the amount of baby and metal characters and the lack of previous racer veterans has received some criticism. The battle mode, however, has a universal negative reaction among reviewers, with most of reviewers preferring the traditional battle modes that previous Mario Kart games did rather than this iteration. The incorporation of the Wii U GamePad has also been a point of contention. Jose Otero, IGN 9/10 Mario Kart 8 is the best kart racing game Nintendo has made in a long time. It strikes a careful balance between refining old ideas while introducing fresh new ones. Admittedly, its gorgeous graphics and jazzy orchestrated soundtrack bolster its presentation, but you’re getting a lot more than just looks with this one – although I spent an awful lot of time gawking at the details in slow-motion, the fast and furious pace of racing with friends both locally and online is what really kept me coming back. Tom Mc Shea, GameSpot 8/10 Nintendo has done an admirable job of keeping Mario Kart relevant. How many franchises can you think of that have remained in top form for more than two decades? Not too many. I do admit that my first impression of Mario Kart 8 was pretty close to a yawn. Mario Kart is one of my favorite franchises, but it's hard to get excited for the same old thing. But the more I played, the more I appreciated the many small changes, and grew to love my time in the Mushroom Kingdom. And now that yawn has changed to a shout of joy. It's more Mario Kart! I'm happy Nintendo still understands what makes this series so darn fun. Thomas Whitehead, Nintendo Life 9/10 Mario Kart 8 has perhaps taken a little longer than we expected to arrive, but it’s been worth the wait. The vehicles and racers have never handled better, the collection of courses is possibly the best yet, while replayability through Ghost Races or — primarily — online races and Tournaments is almost endless. A few design oddities aside, this joins the list of must-have Nintendo games on the Wii U; it’s an accomplished effort that pushes the franchise forward. In years to come the debates over the best Mario Kart games in the series will, inevitably, feature this as a contender. Michael Damiani, GameTrailers 8.6/10 So not everything is perfect, but Mario Kart 8’s stellar visuals, tight controls, and improved online experience make it a great racing game that embraces Nintendo’s lighthearted nature. It's still one of the best in the business when it comes to multiplayer experiences, something we've all come to expect from the Mario Kart series. The overall high quality of the game is so impressive that it doesn't really matter that much that the zero-gravity gimmick barely adds anything that’s truly new. Next time around, though, Nintendo might need to come up with new tricks if it hopes to keep us coming back for more. Andrew Fitch, Electronic Gaming Monthly 7.5/10 Mario Kart 8 looks spectacular, sounds impressive, and delivers solid racing action worthy of the series. But it’s also that rare Nintendo game that manages to be less than the sum of its impressive parts thanks to some ill-advised design choices, half-baked ideas, and gimped Battle Mode. Over the weekend of its launch, Mario Kart 8 sold 1.2 million units worldwide, making it the fastest-selling Wii U title so far and the best selling title for the Wii U as well, selling approximately 2.82 million copies worldwide as of July 30, 2014. As of September 30, the game sold over 3.49 million copies worldwide. In January 2015, it was announced that over 1.7 million total copies (both physical and digital) had been sold in the United States alone, and by March sales had reached 1.9 million. As of March 31, 2015, the game has sold 5.11 million copies worldwide. By the end of 2015 and beginning of 2016, sales have reached to 7.24 million. At September 30, 2016, Mario Kart 8 has reached 8 million sales, including digital, physical, and bundle sales; as of March 31, 2018, it reached 8.42 million, although it was exceeded by its Nintendo Switch port Mario Kart 8 Deluxe, which sold 9.22 million units. Mario Kart 8 won two awards at The Game Awards 2014, being the "Best Family Game" and the "Best Sports/Racing Game". Famicom Grand Prix: F-1 Race: A sign in Water Park shows two submarines; one is of an "original 1987 model", which was the year this game came out, and the first time that Mario was in a racing game. Famicom Grand Prix II: 3D Hot Rally: The Mario's Motors logo is seen at the starting line of Mario Circuit. In addition, Mario's artwork from the game can be faintly seen above the logo itself. Super Mario Bros.: Various sprites of enemies and scenery can be seen on pots in Bone-Dry Dunes. Part of Cloudtop Cruise's course layout involves a large ? Block with a beanstalk coming out of it. Super Bell Subway features graffiti representing World 1-2 in the underground portion, along with an arrangement of the underground theme first heard in that level. Super Mario Bros. 2/Doki Doki Panic: The Shy Guy Metals sign seen at Toad Harbor says that they've been around since 1987, which is the year of the Shy Guys' first appearance. Super Mario Bros. 3: Many aspects of Cloudtop Cruise, particularly the airships, are inspired by this game. Bowser Statues that shoot lasers appear in Bowser's Castle. The sprite of the Angry Sun can be seen in the yellow ornamental fabrics near the start of Bone-Dry Dunes. Super Mario World: Various advertisements seen throughout the game reference this game with the original artwork of Dolphins. Spinners appear in Bowser's Castle. Also, Cape Feathers appear on desks in Sunshine Airport. Also, Tanooki Mario's horn uses the same sound effect as the Spin Jump and Cape Attack. Super Mario Kart: A portion of the title screen music is a cover of Super Mario Kart's title screen music. The Coin item returns with the same function as it does in this game. The Pipe Frame returns as kart body, with the single exhaust design from this game. Donut Plains 3 returns as a retro track. Rainbow Road and N64 Rainbow Road have their design similar to the Rainbow Road from that game, which also appears as add-on content. The desks in Sunshine Airport have feather pens with the same design as the Cape Feather from this game and consequently Super Mario World. Super Mario 64: The merry-go-round music from Big Boo's Haunt can be heard when near the Aqua Cups ride in Water Park. Some of Tanooki Mario's voice clips are recycled from this game. Mario Kart 64: The game features engine sounds during the start-up screen, which is similar to this game's start-up screen. Toad's Turnpike, Royal Raceway, Yoshi Valley, and Rainbow Road return as retro tracks. In Toad's Turnpike, a sign shows a highway advisory radio station running at the frequency "64 MHz", referencing both the system and the game it came from. When in two-player mode, the screen splits vertically instead of horizontally, a feature originally intended for this game. Super Mario Advance: Several of Tanooki Mario's voice clips are recycled from this game. Mario Kart: Super Circuit: Mario Circuit returns as a retro course. Cloudtop Cruise's name in Japanese is "Sky Garden", the same as a course from this game. Cheese Land and Ribbon Road return as retro tracks in DLC Pack 2. Luigi's Mansion: The mansion can be seen in the background of Baby Park. The course Twisted Mansion contains a few elements related to this game. Super Mario Sunshine: Sunshine Airport has a Shine Sprite in its logo. The European release date is used as a serial number on some storage crates in Sunshine Airport (55402MS= Oct 4th, 2002). Voice clips from this game are used for Tanooki Mario. Mario Kart: Double Dash!! : Like in this game, characters hold items in their hands and players can honk their horns when they are out of items (except for the Super Horn). Also, they hold items in their left hands instead of their right. Dry Dry Desert and Sherbet Land return as retro courses. Yoshi Circuit and Baby Park also return as DLC retro courses. N64 Rainbow Road takes place above a city, much like GCN Rainbow Road. Yoshi Topsy-Turvy: Yoshi's artwork which depicts him using his tongue is used as a firework in N64 Rainbow Road. Mario Kart DS: Cheep Cheep Beach, Tick-Tock Clock, and Wario Stadium return as retro courses. Also the B Dasher, a kart from this game, returns as a part of the first downloadable content pack. Also, this is the second 3D Mario Kart game where the players can also use the D-Pad to steer. In addition, the new Battle Mode system is also partially based from this game. Super Mario Galaxy: An image of a Luma can be seen on an airplane (from Galaxy Air airlines) in Sunshine Airport, as well as on the Star Cup trophy. Also, part of Cloudtop Cruise's music is a cover of the Gusty Garden Galaxy's music. In addition, a large rotating Grand Star is featured in N64 Rainbow Road, as well as the Launch Stars. In Twisted Mansion, the arch leading to the underwater section bears Bouldergeist's likeness. Mario Kart Wii: Twelve player races and motorbikes return. The ability to perform tricks on ramps and boost panels returns. Moo Moo Meadows and Grumble Volcano also return as retro courses along with Wario's Gold Mine which returns as add on content. The new Rainbow Road is set above the Earth, just like Wii Rainbow Road and both Rainbow Roads features a part that is similar; the road splits into two paths after a launch segment and also have prominent pink shades. Super Bell Subway has the Coconut Café and an ad for the Fountain Café, referencing two businesses found in Coconut Mall. Various characters have their voice clips reused from this game. Mario Super Sluggers: Several voice clips are recycled from this game. Super Mario Galaxy 2: Part of Cloudtop Cruise's music includes a cover of the Sky Station Galaxy's music. The tunnel at the beginning of Dragon Driftway is modeled after Gobblegut. New Super Mario Bros. Wii: One of the planes in Sunshine Airport has a logo for Propeller Toad Transport with an insignia of a Propeller Mushroom. Super Mario 3D Land: Goomba Towers appear as obstacles in Mario Circuit. The Biddybuggy resembles a Para-Biddybud. The Boomerang Flower appears as an item. A silhouette of Tanooki Mario's artwork can be seen on the back of the Leaf Cup trophy. Tanooki Mario is an available racer via add-on content, and Statue Mario is one of his tricks. Mario Kart 7: The title is a follow-up game of this installment. Gliders and underwater areas return. Music Park, Piranha Plant Slide, and DK Jungle return as retro courses while Neo Bowser City returns as a DLC retro course. Vehicle customization returns from this game. The beat that is added to the music when the player is in first place also returns from this game. Mount Wario, N64 Rainbow Road and Big Blue are split into three sections just like the three courses from this game. Electrodrome has some similarities with Music Park, which is when players drive on the instruments, they make their own sound. It also has Mario Kart 7's point system where each racer gets a point regardless of their position. Various kart parts that originated from this game return. The biggest difference is that the ability to retract the Gliders while in the air has been removed unless getting hit by items launched by opponents. New Super Mario Bros. 2: Twisted Mansion's entrance has a statue of a Boohemoth above it, an enemy from this game. Bone Piranha Plants also make an appearance in Bone-Dry Dunes. New Super Mario Bros. U: The Mecha Cheep appears in this game and there is a glider based on a Waddlewing. Luigi's Mansion: Dark Moon: Parts of the Library Piano music can be heard in Twisted Mansion. Super Mario 3D World: The Piranha Plant appears as an item. Furthermore, most of the fireworks in N64 Rainbow Road use stamp images from this game which replaces the neon-lit signs of the eight playable characters (Mario, Luigi, Peach, Bowser, Toad, Yoshi, Wario, and Donkey Kong) and a portrait of a Boo and Mushroom in Mario Kart 64. An ad on Toad Harbor for Tropical Grocery has a Double Cherry on it. Cat Peach is an available racer via add on content, and the logo for the Bell Cup is the Super Bell. Super Smash Bros. series: Captain Falcon's signature taunt, "Show me your moves! ", which originates from this series, appears in several jumbotrons near the end of the track of the DLC course Mute City. Mario vs. Donkey Kong series: Mini Toads appear at the starting line of GBA Ribbon Road. Super Smash Bros. for Wii U: Mario Circuit reappears as a stage. The songs "Mario Kart Stadium", "Mario Circuit (Mario Kart 8)", "Cloudtop Cruise", and "Rainbow Road (Mario Kart 8)" appear as music tracks for the stage; Cloudtop Cruise was remixed with both the regular and thundercloud versions mixed. Yoshi's Woolly World: The Green, Pink, and Light-blue woolly Yoshi plush toys that appear in the background of GBA Ribbon Road resemble the Yoshis from this game and its compatible amiibo. Mario Tennis: Ultra Smash: Various voice clips are reused. Mario & Luigi: Paper Jam: Various voice clips from the Koopalings are reused in this game. Nintendo Badge Arcade: Various stamps of the characters and objects are collectable badges. Super Mario Maker: The GLA body returns as a Costume Mario power-up. Some voice clips are reused in the eight rare death clips when falling into a pit, e.g. Mario yelling out "Ha, ha, ha! Bye bye!!" when slipstreaming appears in one clip. Paper Mario: Color Splash: The Luigi "Death Stare" meme, which originated from this game, is mentioned by Huey. The title theme and the countdown timer sound is used when Mario and Huey are about to go to Rainbow Road. Mario Kart 8 Deluxe: This game is an enhanced port of Mario Kart 8. All original and DLC contents are included, except stamps, Miiverse compatibility, and the ability to upload highlight reels on YouTube. The game also features a heavily revamped Battle Mode. Super Mario Run: The final five seconds of a Battle Mode match is used in Toad Rally along with its sound. Super Mario Odyssey: Some of the sponsors from this game appear on Mario's mechanic and racer outfit. For this subject's image gallery, see Gallery:Mario Kart 8. Mario Kart 8 has featured several changes from earlier builds to the final build of the game. For example, Mario Kart Wii and Mario Kart 7 mechanics were used as placeholders in the E3 2013 build of the game. Several small changes, such as Twisted Mansion originally being called "Boo House" and Toad Harbor's racing banner originally having a Galaxy Airline logo were present in earlier trailers of the game. Several of the music featured in earlier builds, such as Mario Circuit's music, was more synthesized than orchestrated in final build of the game. An official soundtrack could be ordered by Club Nintendo members in Japan, Europe, and Oceania featuring 68 songs from the game, including those from the two DLC packs. Mario Kart 8 is the first game in the Mario Kart series in which none of the courses share background music; all previous installments in the series have had courses that used the same background music. As well, similar to Super Mario Galaxy and Super Mario 3D World, the entire soundtrack for this game is orchestrated/live-recorded, including the songs that are electronic-sounding; previous games usually had their music already pre-programmed with only keyboards and synthesized/artificial sounds. A North American release is yet to be announced. This glitch is most common in N64 Yoshi Valley due to the numerous paths drivers may follow, though it can happen under specific circumstances in other courses such as Bone-Dry Dunes. Occasionally when a Spiny Shell is deployed and the racers in at least first and second place are in a section where the road forks in two, the Spiny Shell may initially follow the racer in first place and then change its target to the one in second place or the highest place out of those in the other path. This is caused by some courses–in particular Yoshi Valley–having the checkpoint markers that determine the place of the racers being inadequately calibrated with the other routes. This is demonstrated by driving down the old bridge path while in first place: the player drops position while in the turn and then returns to first place once the paths join up again. Nintendo Entertainment Analysis and Development developed Mario Kart 8 in cooperation with Bandai Namco Studios. Furthermore, an undisclosed number of 3D models for artwork illustrations have been made by Marza Animation Planet, a subsidiary of SEGA. The music composition is credited to Shiho Fujii, Atsuko Asahi, Ryo Nagamatsu, and Yasuaki Iwata, with longtime series composer Kenta Nagata serving as sound director with the music performed by the Mario Kart Band. Shigeru Miyamoto and Eiji Aonuma were the general producers, though the latter goes uncredited, and Satoru Iwata was the executive producer. This is the only Mario Kart game wherein the first racetrack (of the Mushroom Cup) is not a circuit course. Unlike several previous installments of the Mario Kart series, the retro courses use their respective Mario Kart logo, excluding the DLC tracks GCN Yoshi Circuit, GBA Cheese Land, and GBA Ribbon Road; the tracks from SNES to GCN use an updated version of the classic logo, while the tracks from DS to 3DS, and the three DLC tracks mentioned, use the current logo. Wherever text appears in the background elements of the game's racetracks (notably in 3DS Neo Bowser City and 3DS Music Park), it is generally written in American English, regardless of the language or region of the game itself. In the Japanese version, the classifier for the Retro courses from Mario Kart 64 has changed to N64, from 64 which was used prior to Mario Kart 8. ↑ 6.0 6.1 Mister Wu (April 18, 2015). A look at the item system. MKBoards. Retrieved December 9, 2015. ↑ 7.0 7.1 7.2 Mister Wu (December 8, 2015). Angular velocity in steady-state drifting and autodrifting. MKBoards Forums. Retrieved January 29, 2016. ↑ Mister Wu's raw Mario Kart data (December 2, 2015).MK8 - angular velocity test part 5: autodrifting - outward drifting vehicles. Youtube. Retrieved January 29, 2016. ↑ Alex Musa (May 30, 2014). There are actually two sub-categories of bike: standard and sport. Standard bikes drift similarly to every other body type. Sport bikes more or less commit to the turn during a drift, sharply cutting in the direction of the turn. . Mario Kart 8 Official Game Guide, page 28. PRIMA Games. Retrieved December 22, 2017. ↑ Mister Wu (July 4, 2016). Outward drifting vehicles gradually reach a lower speed while drifting. MKBoards Forums. Retrieved january 25, 2017. ↑ A transcription of the Actual in-game stats. Please note how inside drifting bikes always have a lower Drift - Manual and Drift - Auto values range than that of the karts. Custom Mario Kart Wiiki. Retrieved January 26, 2015. ↑ Drivers section of the official North American site of Mario Kart 8. ↑ GameXplain - Mario Kart 8 Q&A: Online, Battle Mode, Rainbow Road, Secrets & more! ↑ Mercedes-Benz in Nintendo's new Mario Kart 8. Mercedes-Benz. Retrieved May 14, 2015. ↑ Nintendo Direct 4.1.2015. Posted to YouTube by Nintendo of America on April 1, 2015. Retrieved April 1, 2015. ↑ Nintendo Announces New Details on Mario Kart 8, Super Smash Bros. and More. ComcingSoon.net (April 1, 2015). Retrieved April 1, 2015. ↑ Here's The Mario Kart 8 Patch Notes For 4.0 Update. My Nintendo News (April 22, 2015). Retrieved April 23, 2015. ↑ Mister Wu (June 11, 2015). The relative speed of the engine classes. MKBoards. Retrieved February 19, 2018. For a frame-by-frame comparison using direct game time instead of MKTV, see Raw Results and Results of The tables of top speed in km/h as function of speed value and coins, in particular 200cc class. 1.0 speed without coins: the speed increase with respect to the same case in the 150cc engine class is 50 ± 1 %. ↑ For more information, see the section on the in-game acceleration statistics and the section on the in-game speed statistics. ↑ Mister Wu (October 7,2015). post 37 of the "MK8 Technqiues Thread". MKBoards. Retrieved November 8, 2015. ↑ TWD98 (May 2, 2015). Mario Kart 8 - Is Fire Hopping Faster On 200cc? Youtube. Retrieved November 8, 2015. ↑ A list of elements used in Mario Kart 8. The Adjuster200cc is among the Objects, and its effect is to increase gravity. Retrieved June 26, 2016. ↑ King, Ashley. (May 1, 2015.) Mario Kart 8 update 4.1 is now live. Wii U Daily. Retrieved May 1, 2015. ↑ Makuch, Eddie (October 31, 2014). About Half of All Wii U Owners Have a Copy of Mario Kart 8. GameSpot. Retrieved November 1, 2014. ↑ Makuch, Eddie (January 16, 2015). Mario Kart 8 US Sales Reach 1.7 Million, Amiibo Up to 2.6 Million. GameSpot. Retrieved April 26, 2015. ↑ Duwell, Ron. (April 17, 2015.) Majora's Mask 3D edges towards 1 million sales in the States. TechnoBuffalo. Retrieved April 26, 2015. ↑ Lee, Tyler. (May 7, 2015). Mario Kart 8 Sales Crosses The 5 Million Mark. Ubergizmo. Retrieved May 7, 2015. ↑ Hansen, Steve (October 26, 2016). More like Mario Kart 8 million: Here are the Wii U and 3DS best-sellers Destructoid. Retrieved October 27, 2016. ↑ IR Information : Sales Data - Top Selling Title Sales Units. Nintendo. Retrieved April 26, 2018. ↑ List of Non-Films works by Marza Animation Planet. Retrieved July 1, 2016. This page was last edited on April 10, 2019, at 20:13.